Hiring? Toptal handpicks top fundraising consultants to suit your needs. Term sheets are legal documents that define the investment parameters to be adhered to by parties in a business agreement. Investors can influence investments far beyond the time that their check is cashed. A term sheet will clarify this level of influence. As with contract offers for employment, term sheets are a process of negotiation between investor and investee. Having a healthy discussion about the points ensures that both parties are aligned for the long haul. Before engaging investors, among your founding team, ensure that you have agreed on your own ownership percentages and how stock is to vest. Don't put all of your eggs into one investor-sized basket. Lining up different investors gives you more touch points on what your perceived valuation should be. Pay consideration to the natural "habitat" of your investor, if they usually invest in other kinds of deals, there may be more legal points to iron out. Also, speak to other founders that have raised capital from them: due diligence is a two-way process. Find neutral and good advice for yourself, either legally, or in the form of a mentor. Trust your own instincts and don't necessarily default to those recommended to you. Preferred stock: is a different class of equity that has a higher payment priority than common shareholders (i.e. founders). It also allows investors to attach various clauses exclusive to them. Dividends: are permitted for preferred stock and there are three ways of this materializing. The most founder-friendly option is when the company decides if it pays out a dividend. Liquidation preference: determines the magnitude of the payout that an investor can receive upon a liquidation event, before other shareholders. Participation rights: are inserted to determine investors' payout after their liquidation preference is fulfilled. Non-participation is the most founder-friendly option as it forces the investor to choose between its liquidation preference OR its pro-rata share of the business. Anti-dilution clauses: protect investors from their ownership percentages being diluted if the company value falls. If seen as necessary, the weighted-average method ensures that dilution is fairly shared among all shareholders. Super pro-rata rights: give investors first priority to invest in the future, but for a higher proportionate amount. This clause can stall and crowd out future rounds, so should be used with caution. Employee stock option pools: are important parts of term sheet negotiation, pay attention to the size of the pool and whether it's created in the pre or post-money valuation of the business. Information, transfer and drag-along rights: such clauses give important decision-making privileges to investors that grant them power beyond their default percentage ownership. The process of raising money for entrepreneurs has been demystified in recent years, through both startup culture moving to the mainstream and more transparency being provided via various blogs and podcasts. Yet, despite this, certain aspects of the fundraising process continue to be challenging for founders. In my work, I often get anxious requests to help founders process investment round term sheets, where they’re either confused by the terminology or worried that questioning points may forfeit the deal. There have been numerous efforts aimed at outlining what a “neutral” term sheet should look like (e.g. Y Combinator’s SAFE Financing Documents and NVCA’s term sheet template resources). It’s very important for founders to familiarize themselves with these because generally, an investor will be the one presenting the first draft term sheet. 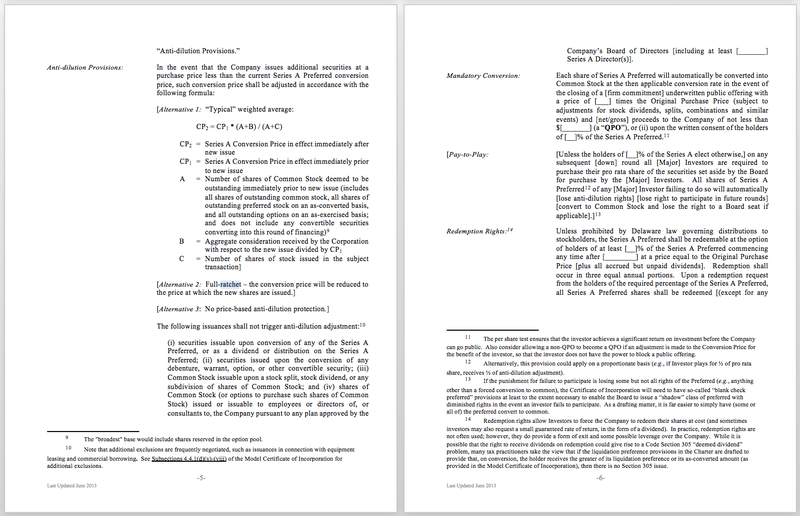 To be clear, it is rare to see a term sheet full of aggressive terms that penalize the entrepreneur. Most investors know that alignment between founder and shareholder is pivotal for realizing a significant return on capital. Nevertheless, there are unfortunately cases where certain term sheet clauses can result in a founder unwittingly losing control or economics in their business. This article highlights potential pitfalls that can arise from this terminology and explains the potential consequences for founders. N.B. While this article was written primarily with founders in mind, it can also serve as a useful resource for startup employees, who have stock-based compensation. 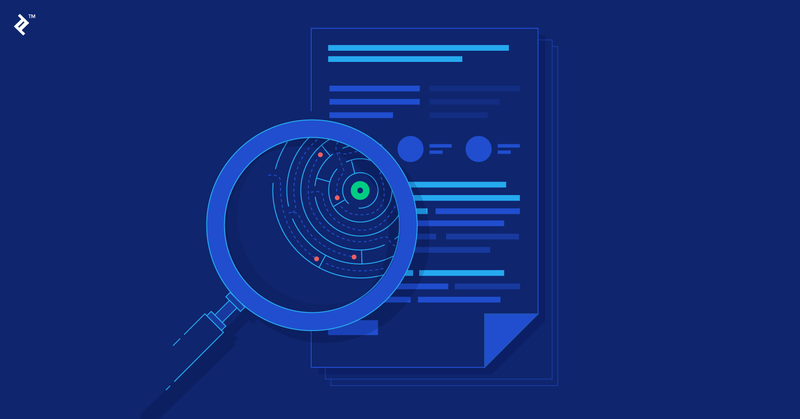 Before going into the details of the term sheet clauses, it first makes sense to highlight some of the initial groundwork that needs to be completed. Below are the areas that I find myself most-often counseling entrepreneurs on when asked for fundraising advice. Internally, before entering negotiations with outside investors, make sure to put in place an appropriate vesting schedule. A sudden departure of a founder with vested stock leaves dead-equity on the cap table, which can have important implications on the efforts of the remaining founders. Here’s a good guide to get you started on the subject. Getting two independent term sheets at the same time is an excellent way of processing your value. You can compare the two in isolation and get a more rounded view of how investors are appraising you. Also, if one investor sees that you’ve put all of your proverbial eggs into their basket, it may turn the screw on certain negotiation elements. If a startup raises a seed round from a renowned angel or early-stage VC fund, then it’s going through a well-oiled machine and surprises should be unlikely. Conversely, if an opportunistic late-stage private equity investor or new-to-the-game corporate is investing, then there may be more legal points to iron out if it is trying to port over a term sheet normally used for other kinds of deals. With regards to your investor(s), view the process as a two-way due-diligence exercise. Their credentials should be assessed beyond how deep their pockets are. Choosing your investors means choosing long-term business partners who play a fundamental role in the development of your business. So make sure to do your homework. Here’s a useful article to get started. The concepts of pre-money and post-money valuation are required learning for anyone raising money. A slip of the tongue between either can be material in terms of ownership percentages and economics. Be aware of how your valuation is benchmarked against other companies. A high valuation can certainly show some external validation and stronger paper wealth. However, it also raises the bar for your performance levels if you want to get to a future round, a situation also known as the “valuation trap”. Finally, in relation to other external parties, contract a lawyer with a track record in this area, and make sure to take your own decision on who to hire. Don’t necessarily choose your investors’ recommendations. This article offers some useful insights into tackling the legal side of things. With the groundwork covered, we can now go into the details of the most common term sheet clauses that create problems for founders. Early stage investors generally opt for what is called preferred stock for their investments. Preferred stock is a different class of equity from common stock; the premium economy to its cattle class, so to say. By having a different stock class, investors are able to add unique terms and conditions that do not apply to other classed shareholders. This can often be seen at IPO time, where voting rights tend to be unevenly distributed across the classes of stock. Preferred stock sits above common stock in the debtor hierarchy, so holders enjoy the benefit of having their money returned before other stockholders. In a successful exit scenario, this is a forgotten formality, but in a distressed sale, it makes a material difference. The term sheet clauses detailed in the rest of the article are therefore generally only going to apply to the class of preferred stock that your investors will be creating upon putting money into your company. A characteristic of preferred stock is that it contains a fixed dividend percentage (yield) that is owed to its bearer. Dividends are shares of profits that are paid out periodically and most commonly associated with blue-chip stocks. Startups generally tend to recycle any cash flow back into the business, although there are rare exceptions. “Discretionary”: Dividends are paid when the business chooses to do so. “Fixed”: Guaranteed dividends are paid periodically in cash or stock. The first option is the most founder-friendly, but all financings are on a case-by-case basis. So be aware that for the other options, the obligations will increase the economic considerations due to investors, relative to their initial cash investment. One of the most common startup term sheet clauses that you will come across is a liquidation preference. As the name implies, liquidation preferences determine the hierarchy of payout upon a liquidation event, such as a sale of your company. 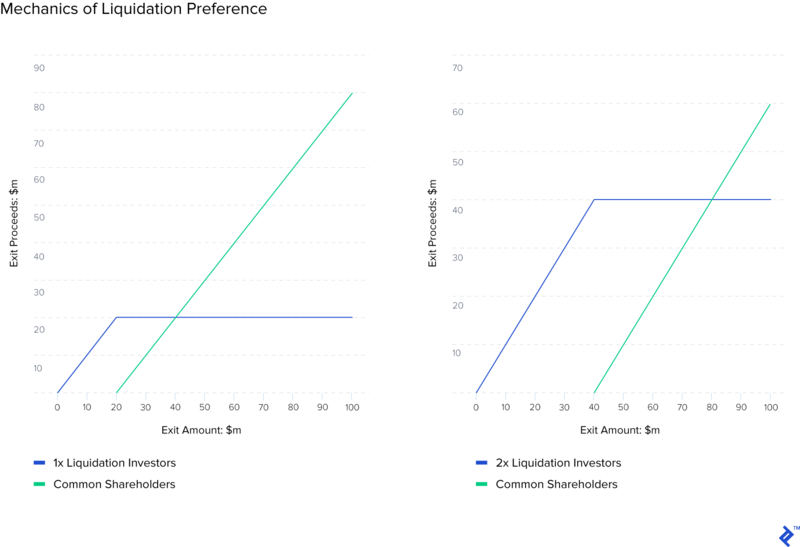 Liquidation preferences allow investors to define the initial magnitude that they are guaranteed as a payout. Let’s look at an example. A 1x liquidation preference means that investors are guaranteed to get 1x of their initial investment back. So if your investors put $10 million into your company, and the company gets sold for $11 million, they will receive their entire $10 million back before anyone else. A 2x preference would raise this hurdle to $20 million, and so on. Remember that this all occurs before common stockholders (i.e. founders and employees) can begin receiving proceeds. In each example (the first example being a 1x liquidation preference, and the second example is a 2x liquidation preference), the investor has invested $20 million for a 20% post-money consideration. As you can see from the exit values presented on the x-axis, for low-value exits, the liquidation preferences give the investor the bulk of the security and relative value, which pulls back returns from common shareholders. If participating preference stock is issued, the investor receives opportunities for further upside after their liquidation rights have been fulfilled. This allows investors to not only reclaim their original investment back via the liquidation rights but to then share remaining proceeds on a pro rata basis. There are three types of participation rights, which range in terms of their economic upside to investors. During negotiations, an entrepreneur must pay specific attention to what type is stated. Full Participation: The most investor-friendly option. The investor first receives their liquidation preference and then a pro-rata share of any remaining proceeds. Capped Participation: As per full, but the total return from liquidation and participation rights are capped at a defined multiple. Non-Participating: Most entrepreneur-friendly option. The investor must choose between their straight liquidation preference or a pro-rata share of all proceeds. The consequences of these terms are that investors can often receive more economic proceeds from an exit than correspond with their actual ownership percentage of the company. Only in successful exits with 1x non-participation would an investor receive proceeds (via electing for their pro-rata) in accordance to its actual percentage stake. These clauses are inserted by investors as risk mitigants and rewards for showing early faith in a business or during rocky times later on. It is best to be fully aware of the terms agreed upon and to make some test scenarios, to avoid any unpleasant surprises in the future. 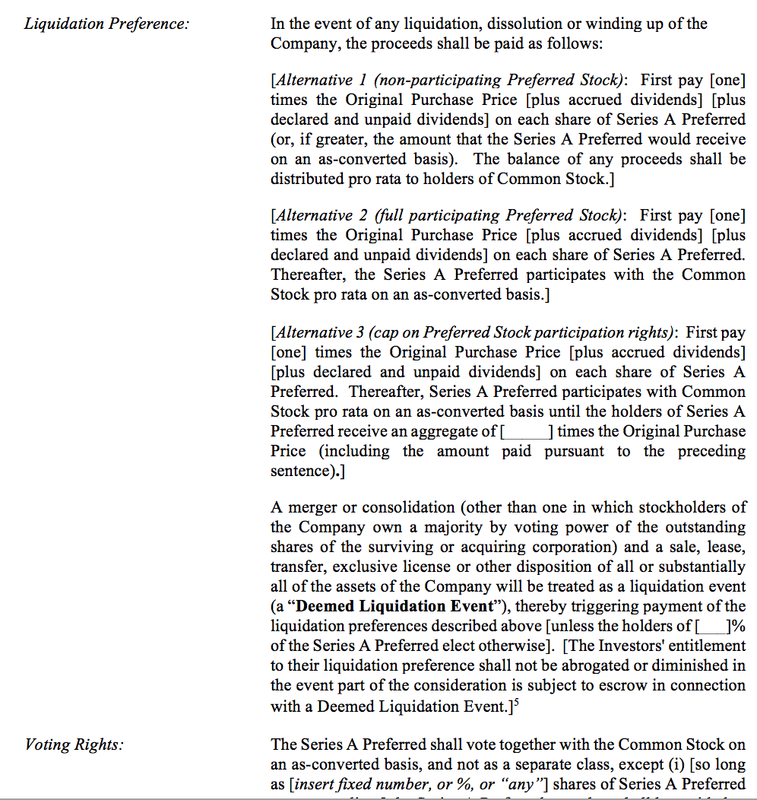 The liquidation preference and participation rights will often be included together within the term sheet. Below is the NVCA example of the clause in, so that you may begin getting accustomed to how it looks. Below you can see an expansion of the scenario that was introduced in the liquidity preference section. 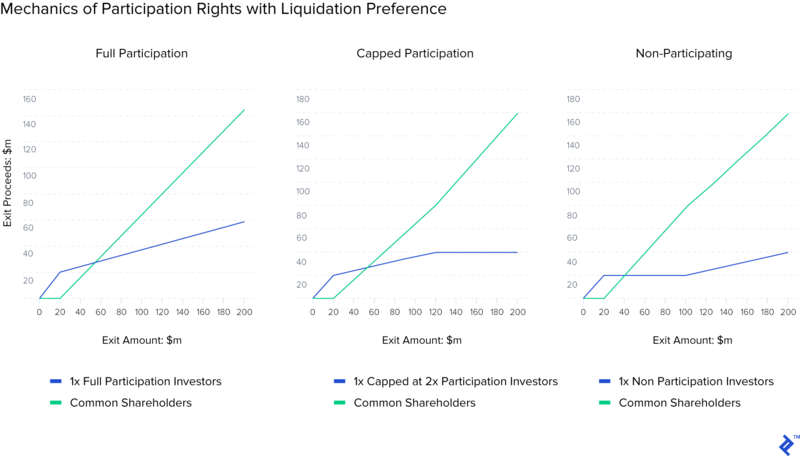 In this example, payouts are shown for the different participation rights that the investor could additionally attach to their stock alongside its 1x liquidation preference. Evidently, the full participation scenario results in the highest return profile to the investor. The capped investor follows a similar trajectory, before maxing out at their $40 million cap (2x). For the non-participating investor they first receive their 1x, but after returns of $100 million, their payout (and the founder’s returns) will start to correspond with their actual percentage ownership. In this report from WSGR, 81% of respondents used founder-friendly non-participation terminology. This dropped slightly for up-rounds, where investors will have responded to higher valuation terms by inserting more protection through capped and full participation rights. In general, a 1x liquidation preference with no participation is a fair offer for an early stage financing round. A rational investor always enters into a deal because they believe that it will become a home run success. Despite this mentality, they will often look to put contingencies in place to secure ownership stakes in the event of disappointing future outcomes. This is particularly pertinent in down round scenarios. At this crossroad, a lower future valuation of investor stock will not only harm economic interests but could also dilute ownership stake and thus reduce strategic influence over the company. To mitigate lower future valuations, investors can insert anti-dilution clauses that act to readjust their ownership stake to avoid receiving too hard a hit. The main applications of this are via the weighted average and full ratchet methodology. You could visualize these as insurance policies for investors to protect them against down rounds in the same way that put options would be applied in portfolio management. Both methods involve converting the holders’ existing stock into a new allocation to account and compensate for the effects of a down round. The difference between the two is that weighted average dilution accounts for both price and the magnitude of the new issuance against the existing capital base. Full Ratchet just accounts for the effect of the new price. By contemplating the magnitude of the new round, the weighted average method is more founder-friendly. This article provides clear explanations if you wish to learn more about the calculations behind these methods. These days, a full ratchet can be a rare sight within early-stage investing term sheets. They are seen as an extreme way of applying investor protection because their application can actually result in investors increasing their ownership percentage once they are triggered. This is because a Full Ratchet will trigger a repricing of all the clause-holders’ shares, even if just one new share is priced at a value below theirs. To demonstrate a comparison of the effects of the anti-dilution methods, a visual summary of their resulting ownership percentage changes can be seen below, after their inclusion in a theoretical Series A round. 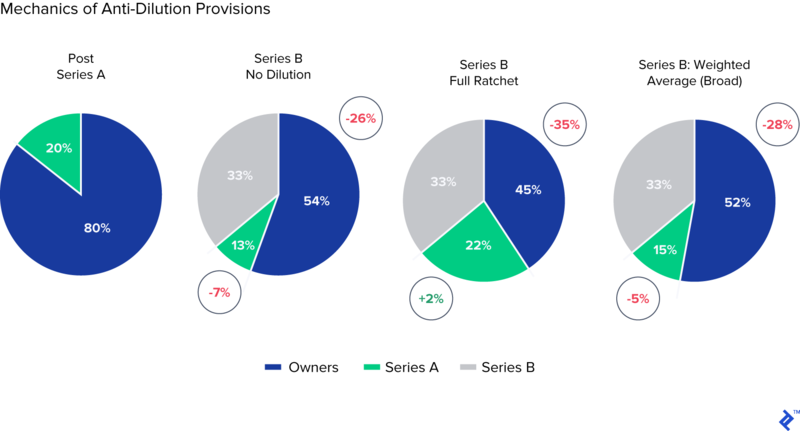 Notice how in the Full Ratchet example, the Series A investor ends up with a higher percentage share in the company in the next round. Note: Series A investors invested ​80 million pre-money Series A valuation. The proceeding Series B round investor invests ​60 million pre-money. If dilution protection is being negotiated, unless your company is in a very distressed financial situation, you should strongly argue for broad-based, weighted average dilution coverage. Pro-rata rights are a mainstay of early-stage rounds and generally are positive factors to include in term sheets. They provide an option (the right, but not an obligation) for initial investors to invest in future rounds in order to maintain their ownership percentage, which would otherwise be diluted. This puts them at the front of the queue to double-down on their winners, maintain a material percentage of ownership and be rewarded for their initial faith. Pro-rata rights also act as a catalyst for getting the ball rolling in new rounds and to cajole new investors to enter. While demand for equity can get crowded on future rounds, and some new investors may grumble about ceding available stock to smaller investors, they are generally accepted. Where the pro-rata right gets more complicated is when it comes in the form of a super-pro rata right, which allows the holder to increase (as opposed to maintain) their ownership stake in future rounds. If this subsequent round is being hotly contested by new investors eager to enter, and earlier investors decide to exercise super-pro-rata rights and increase their ownership, the result may end up being that there isn’t enough equity for larger investors to buy. Since larger funds generally need to invest larger ticket sizes, if they start finding it hard to hit their minimum investment amounts, they may decide to drop out of the round altogether. In such a situation, founders may be forced to sacrifice more of their ownership to appease both new and old investors’ allocation requirements. The situation could also result in the super pro-rata right investor holding the company hostage. For example, if there is resistance against providing them with an increased allocation, they could disrupt the funding round by attempting to veto the transaction via protective provision clauses (see section below). It’s common practice for startups to use Employee Stock Option Pools (“ESOPs”) to incentivize and reward employees. This is all part of financial theory folklore, to align interests and avoid agency costs. It’s natural then that a discussion will occur about stock options during your term sheet negotiation. An analysis of AngelList showed that stock grants of between 0.25-3% (average: 1.375%) are required for the first 34 employees of a business, so that by a Series A round, businesses will have between 15-25% of diluted ownership allocated to staff. Top-ups will be required each round and by later stages, startup employees will own between 10% (Europe) and 20% (USA) of their businesses. Pay attention to these averages when creating an option pool: don’t create an unnecessarily large one relative to your size. This will lower the potential for unallocated equity and ensures that future investors fund the burden through later top-ups. Are they Included in the Pre or Post-Money Valuation? If a term sheet states that a business’ pre-money valuation includes an option pool valued off its post-money, fully-diluted capitalization, then the creation of the pool will be funded entirely by the shareholders before the investment occurs. 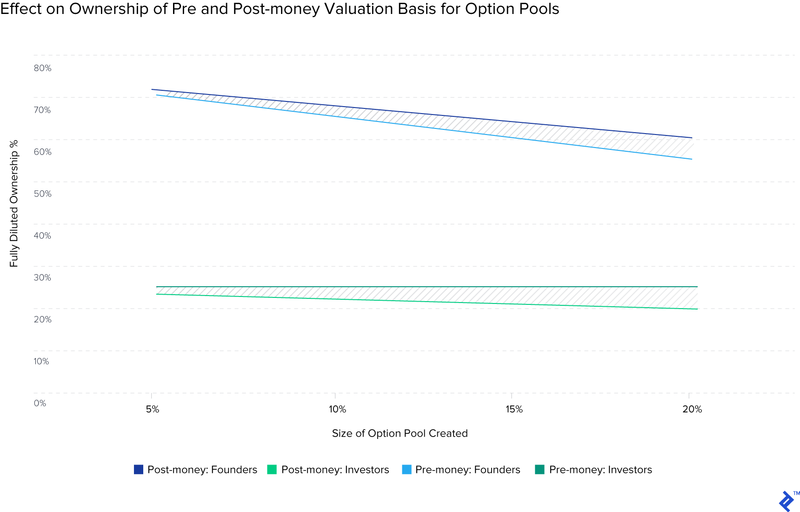 This article provides a thorough explanation and the math behind this scenario, wherein the “real” pre-money valuation is effectively lowered by the inclusion of the option pool. Founders and early investors have to fund the options themselves, despite them being based on the value of the business after its new financing! Thus giving the new investor the benefit of a lower share price to invest at. In more egalitarian scenarios, the option pool is created post-financing, which results in new and old shareholders sharing the dilution. To visualize this, the chart below shows the effect on ownership changes from option pool creation in pre and post-money scenarios. In this simple example, $5m is being invested at a (real) pre-money valuation of $15m. The founders are the only early investors in the business. For the founders, the delta of wearing the entire cost of the option pool creation versus partially stretches from 1.25% to 5% based on the option pool size. This is material dilution and warrants precautionary measures when reviewing the relevant term sheet section. These terms are not as quantifiable as others but are still very important. They pertain to your investors’ conduct in relation to their ownership stakes in your company. The lax terminology here could disrupt progress through conflicts of interest. For example, having a right of first refusal clause permits that all current shareholders are notified and allowed to buy stock from an investor who wants to sell. This along with an approval of sale clause, which instructs the board to approve all transfers of ownership, prevents secretive transfers of stock from happening. Without these clauses, a disgruntled or incentivized investor could, in theory, sell their stock to your competitor without anyone knowing. Here is the NVCA wording for a right of first refusal. Be careful if a right of first refusal clause pertains to the acquisition of your company. In such situations, the investor (usually a corporate) will have first rights to buy the company outright in the event of a sale. While this could trigger a bidding war, it equally can be a negative signal for future investors, or indeed customers/suppliers that compete with the claused investor. Confidentiality agreements and non-compete clauses prevent conflicts of interest arising when investors look to leverage their portfolio by sharing information or investing in competing business units. Not only do they prevent competing firms from gaining an unfair advantage, but they keep investors focused on your ongoing success. Unlike other sections in this article, which discuss how the inclusion of some terms could be harmful to you, the inclusion of the above points could actually help you. I encourage you to push for the inclusion of information and transfer rights, with a clear elaboration of their application. Protective provisions grant investors veto rights that they otherwise would be unable to exercise at the board level, due to their percentage stake not constituting a majority. In general, they are a very standard practice in relation to key issues, such as a company sale, or stock issuance, because it forces the discussion to include all involved parties. Despite good intentions, these protective provision terms can sometimes go too far. If there are punitive veto restrictions on expenses and hiring sign-offs, they could cause friction and slow down decision-making abilities. Drag-along rights for investors allow them to compel other classes of stock to agree with their voting demands for a liquidation event (i.e. a sale, merger or dissolution). Traditionally, they have been deployed to allow the majority shareholder to cleanly force through a sale, by exercising their majority (>50%) over the minority shareholders to follow their choice of action. I say traditionally because if all stockholders are of the same class and terms, the demands of the majority investor will most likely be economically aligned with the minority shareholders. When different classes of shares and their separate terms are introduced, as we have discussed earlier, it increases the importance of drag-along rights provisions. In this instance, the majority vote required to trigger the drag-along can just come from the majority solely within the preferred stock class. If this decision does not need ratification by the board, common stockholders may have to follow a decision that is out of their hands. The term template from NVCA demonstrates how the terminology for this clause can be adapted in many ways. There are situations in which an investor may be keen to sell, but the founders are not. An unexpected buyout offer during stressed operating times can an appealing option to an investor who holds attractive liquidation and/or participation rights. By exercising drag-along rights, these investors can force founders to sell. Negotiation tactics that entrepreneurs could apply in order to avoid the above, would be to increase the majority vote required (try higher than the opening gambit of 50%) to trigger the drag-along clauses. Also, resist the exclusion of the board approval ratification, to add another security layer to the decision making process. Additionally, adding a covenant of minimum sales price to the drag-along provision can ensure that if it is triggered, there is enough space between that and the liquidation preferences to leave economics on the table for the entrepreneur. The most friendly application of this provision is when it applies to just a majority of common stockholders. In this event, preferred stockholders face their own trade-off of converting to common stock to participate in the vote, and if they then do so, sacrificing their liquidation preference rights. Convertible notes are the most popular legal structure for seed-stage companies raising capital. The fundamental difference between a convertible note and a straight equity structure is that it is a debt instrument with provisions to convert into equity at a later date. The “entrepreneur friendly” convertible note serves a very important purpose for startups. They avoid the valuation discussion at a stage in the startup’s life when valuations are really just guesses, in addition to being cheaper (in legal fees) and faster to negotiate than straight equity. There has been much said about convertible note terms and what their ramifications are for conversion. For that, I will only focus on the high-level numeric terms and how you can position yourself around them. Cap: A HIGHER cap is better because if triggered, the investor will own less equity at conversion due to being priced closer to the equity round terms. The modal range for a cap is that the target priced round valuation is 1.8x** higher**. Discount: A LOWER rate is better as investors will be converting closer to the fundamentals included in your future priced round. The same data as above gives guidance that a 20% discount is par for the course. Interest Rate: Often overlooked because generally, no interest coupons are ever actually exchanged. As a formality, a LOWER interest rate will benefit you, when the interest is accrued up into issued stock. The rate will be tied to the underlying floating benchmark rate for your market. The obvious intention for investors is for the note to convert during your next round: a priced equity round. But pay attention to other events that could trigger conversion, to remove any ambiguity. Having pre-agreed floor multiples of return in the event of M&A, or an acqui-hire sale, will ensure clarity should these unexpected events occur. If there are no defined terms, beyond the standard priced-round conversion event, the investor may only be legally obliged to receive their original investment back. This could result in an ugly and/or drawn-out end to your relationship with them. Also, be cognizant of the note’s maturity date and what will happen at this point. Is it stated that the note is to be repaid, or is there a stated conversion price to equity? Bear in mind the interest rate, as the longer that the note lasts and the higher the rate is, the more that will accrue into equity. The points discussed demonstrate the intricate trade-offs that can exist when negotiating investment rounds. An investor’s involvement does not end once the check is cashed, and the explanation of these clauses shows how they can significantly influence the outcome of their investment in other ways. Nevertheless, if armed with the correct knowledge, founders can look to not only avoid these pitfalls but actually use these terms as effective protective measures. I hope that this guide has provided you with a useful high-level summary of what to look out for as you head into any term sheet negotiations. Returning to an earlier point, should you have additional questions, having an experienced lawyer by your side can be extremely helpful. Nevertheless, feel free to post any questions or comments here and I’ll try and address them where possible. What is a term sheet for financing? A term sheet is a document which outlines the key financial and other terms of a proposed investment. It can also be called a "letter of intent", "memorandum of understanding" or an "agreement in principle". It is the first major step in a financing transaction for material terms of the deal to be negotiated. With the exception of certain clauses, the provisions of a term sheet are not intended to be legally binding. Clauses that could provide legal liability tend to be in areas of confidentiality, exclusivity, and costs. What is an anti-dilution right? An anti-dilution right protects an investor from equity dilution resulting from future issues of stock at "down rounds" - when stock is sold at a lower price than what the original investor paid. Anti-dilution rights adjust relative ownership percentages to prevent new stock lowering an investors' stake. What is a super pro-rata right? A super pro-rata right is a clause given to an investor that allows them to invest in future fundraising rounds and increase their material ownership percentage of a business. This is different from a pro-rata right, which just allows investors to maintain their current ownership level through future rounds. Great resources and depth of coverage Alex! I would always remind founders and investors...A great securities attorney is always called for regardless of your depth of understanding - this stuff is too important not to get it 100% right. Nice read! Really did a great job of defining some key points and including helpful links along the way. Thanks!